Cooler: HIS iFan can further cool down VPU 11°C less than generic heatsink, to extends card life and durability. Get the most from your gaming, digital photography, video editing and web surfing experiences with the HIS X550, an affordable graphics upgrade featuring ATI's industry-leading performance, technology and support. 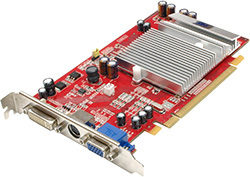 The HIS X550 fully supports the PCI Express® bus, the newest PC industry standard for delivering maximum real-time performance for your graphics-intensive software applications. 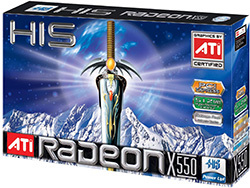 With the HIS X550, your computer games come to life. The HIS X550 supports today's top game titles and combines ATI's SmartShaderℿand SmoothVisionℿtechnologies to deliver incredible processing power and stunning 3D image quality. The HIS X550 also fully supports Microsoft® DirectX® 9, ensuring that games look and play brilliantly, especially in high-definition. The HIS X550 allows you to get the most from your digital still and video cameras, enabling you to see the true brilliance of your creativity, whether you are editing a video or previewing a photo before printing. The HIS X550 pushes high-end monitors to their full capacity and maximizes the visual display capabilities of your digital input devices. I ike it a lot.